Samuel Pepys (pronounced “peeps”) kept a diary for ten years, 1660-1669 (http://www.pepys.info/index.html ). He helps us understand the great fire of London, some of the plague years, the aftermath of the English civil war, and the English navy. Equally important, he helps us see what life was like. We hear him kicking himself for “carrying my watch in my hand in the coach all this afternoon, and seeing what o’clock it is one hundred times.” A man fretting. For recording the great and little events of the day, Pepys has been given immortality. We read him still. There is no shortage of diarists these days, not with billions of blogs on line. But will bloggers find immortality? No. This is not just because there are so many of us. The trouble is we assume the things readers will want to know in 100 years. There are, for instance, countless blog entries from people experiencing the flu. But what history will care about are all the details that struck us as too obvious or banal to mention. What the “flu” was like, what we took as “medicine.” The “pharmacy” we got the medicine in. The conversation we had with that man in the lab coat. The advice we got from friends. What we wore while recuperating. What we watched on TV. What was illuminated by that faint light in the “refrigerator.” The idea, for instance, of “comfort food.” (What was it? What comfort did it give?) What we talked about on the “phone.” What “emails” we wrote. What happened to personhood? What was it like to be us, as we lost momentum, as our affairs went into suspension, as our life began slowing to come undone. Where did the mind turn in this rare inactive moment. What fretting did we do? In 100 years, the flu will be an exotic experience. (We read Pepys for his accounts of the plague; we know longer know what this was like.) Historians will hold conferences on the experience of sickness and curing. And they will consult our blogs mostly with unhappiness. We have 3.74 million references to “flu” in the blogs of the early 21 st century. We have the medical accounts of what it was and what curing was. But we do not know what it was like as an experience. These bloggers were talking to one another. They were not talking to us. But I am happy to report that I have discovered one web log that offers a meticulous record, one might even say Pepysian account, of one flu in one life. Using the weblog entries of one Sarah Zupko , I intend to show how the “flu” worked as a social, cultural, emotional, physiological and medical event in the life. With this as my platform, I will seek, then, to illuminate key aspects of everyday life. Sarah Zupko ’s account of the flu she suffered in the 14 th week of their year 2003, in conjunction with other records we have at our disposal, help us to see how the “self” was constructed, maintained and, in a word, lived. In an odd way, we owe this now vanished virus a debt of thanks. Under its duress, Zupko was moved, meticulously and with rare sensitivity, to reveal not just what it was to be “sick” but what it was like to be a creature of this historical and cultural moment. There are two strategies here. The first is simply to document everything we can and let history do the sorting. In the case of “blanket documentation,” we don’t need to choose because we seek to capture everything. Prose documentation of and for each. Do interviews with everyone who will put up with one. Set up your video camera (if you have one) and leave it standing in the living room (if you have one). When someone comes over, sit them down and ask them these questions… and anything else that occurs to you, and capture anything else that occurs to them. There will be moments when you’ll think to yourself, “Oh, what’s the point, this is so obvious.” But think about what you would give to have account like this from your life, say, 20 years ago. If would be a dear possession. Think about what you would give to have this account of your father’s life when he was the age you are now. Think about what you give for an account of your great, great grandfather’s life. By this time, you have materials that historians would be pestering you to have a look at. This is the second strategy. This is the documentation of a single thing, person, place, object, event. It could, for instance, be the flu. Now the trick is to tear ourselves away from the familiarity that, blessedly, makes so much of our experience intelligible and manageable. Only thus can we deliver what historians want (and what we will be pleased to have in 20 years). There are a couple of aids here. One is surprise. Surprise occurs when assumptions are violated and it represents an opportunity to capture what these assumptions are. I was standing in Grand Central Station last week and a man passed me wearing a burgundy red fedora. It was too stylish to be a prank, too odd to be a simple act of style. It forced me to think about hats and to see the conventions that govern them. Another is humor. This too depends on violated assumptions. Victorian jokes now strike us as not very funny. And this is because we no longer share the cultural assumptions they assumed and on which they operated. Take a moment of humor and supply the archeology on which they rested. A fourth might be called the Goffman effect. Erving Goffman sought out the company of people who had forgotten or misremembered the rules of everyday life. They stood too close to him. (Ah, so there is a rule that says we must remain 12 to 16 inches from a conversational partner.) They gave too little eye contact or too much. (Ah, so there’s a rule…) They shouted or whispered. And so on. The trick here is to treat social error as an indicator of social convention. Once you have performed your Pepys scrutiny, burn it on a CD or DVD and send one copy to the youngest responsible member of your family, with careful instructions that they are to do the same in 20 years. Send the other to the Smithsonian. Congratulations, you are now immortal. This entry was posted in Uncategorized and tagged Blogging, capturing the present, Duncan Grey, history, how to blog, immortality, Samuel Pepys, Samuel Pepys home page, Sarah Zupko on March 30, 2014 by Grant. 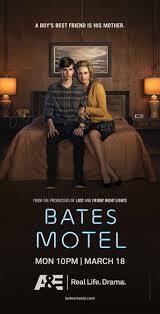 I am watching Bates Motel (Monday nights, A&E). It’s engaging and scary. Tune in if only for the performance by Vera Farmiga which really is astoundingly good. There’s the police procedural, that work horse of network TV. Law and Order, if you count all 6 versions, now has over 1000 episodes to its credit. Then there’s CSI, NCIS and Criminal Minds. In all of these, we open with a crime and we close with some kind of resolution. Chaos breaks into the world and then gets routed out of it. Then there’s the another category that forgoes that this narrative and moral clarity. I am thinking of Bates Motel which is shot through with menace and a mystery never goes away. You will say this is the nature of horror. But this “dreadful indeterminacy” can be seen also in shows like Fringe, Lost, Orphan Black and Dolls. Something is out of kilter, the world no longer spins on its axis, the forces of disorder are building, and we are done for. 1. Is this a fair contrast? 2. Is the police procedural category diminishing? 4. If there is a second category, what should we call it? 6. Why is it growing? This is a question for those masters of popular culture, Sarah Zupko, Matthew Belinki, Tara Ariano or Sarah Bunting, and anyone else who wants to prove they are in their league. This entry was posted in Uncategorized and tagged A&E, Bates Motel, Criminal Minds, CSI, Dolls, Fringe, Law and Order, Lost, Matthew Belinki, NCIS, Orphan Black, police procedural, Sarah Bunting, Sarah Zupko, Tara Ariano, trends, Vera Farmiga on May 7, 2013 by Grant.